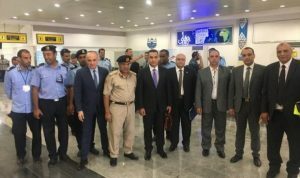 An Egyptian Civil Aviation Authority team arrived at Benghazi’s Benina airport today to assess security and other standards. It is understood that if the team are satisfied they will give the green light to flights between all Egyptian airports and Benina which reopened for civil flights on Saturday after a three-year closure. Libyan carriers are allowed to fly to Alexandria but not Cairo. The Egyptian authorities put a ban on all flights from Libya to the Egyptian capital in August 2014, a month after the capture and destruction of Tripoli International Airport by forces led by Salah Badi supporting the Libya Dawn alliance. At the time, the ban was described as “temporary”. It is not clear if the team give the thumbs-up to Benina that Egyptian airlines will also start flying in to Benghazi. It was also announced today that the Anti-Illegal Immigration Agency in eastern Libya has opened an office at the airport. Meanhile in Tripoli, the head of the Libyan of Civil Aviation Authority, Nasreddin Al-Ain, was reported today saying that three foreign airlines were making plans to fly to Mitiga. He said one was Italian, another Turkish. There have been reports circulating for some time that Turkish Airlines is interested in resuming flights to Tripoli. However, Turkish officials say it will only happen when there is full security at Mitiga. Although the EU has banned normal commercial flights to Libya, there has also been talk of regular flights between Tripoli, Rome and Milan on the same charter-flight basis as those operated by Medavia between Tripoli and Malta.